Heeft u een vraag voor Good Friend Hotel? 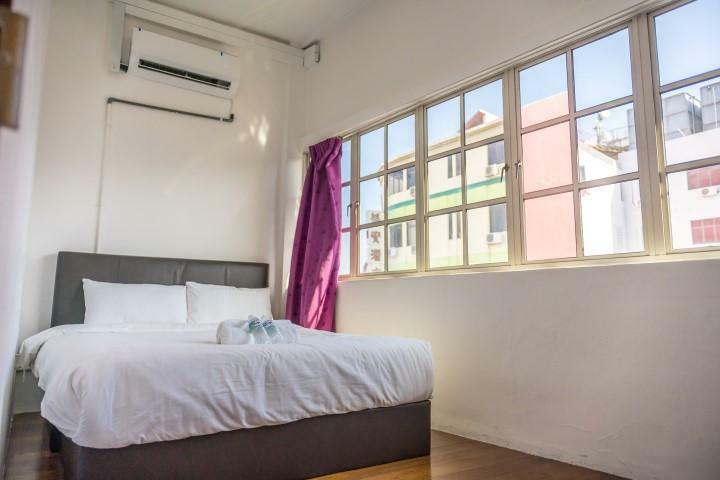 D Mo Inn, gebouwd in 2013, is een aanwinst voor Penang en een slimme keuze voor reizigers. Gelegen op 7.1 km van het hart van de stad, bevindt dit 1-sterren hotel zich op een excellente locatie met de grootste attracties binnen handbereik. Een baken van rust en ontspanning: dit hotel is het perfecte verblijf op steenworp afstand van bezienswaardigheden als Loo Pun Hong, Kapitan Keling Moskee, Kapitan Keling. Het D Mo Inn biedt gasten superieure dienstverlening plus een breed scala aan voorzieningen en is toegewijd om uw verblijf zo comfortabel als mogelijk te maken. Dit hotel beschikt over vele faciliteiten die zelfs de meest veeleisende gasten zullen overtuigen. Hotelkamers zijn zorgvuldig ingericht om het hoogste niveau van comfort te bereiken, met handdoeken, internet (draadloos), draadloos internet (gratis), rookvrije kamers, airconditioning in iedere kamer. Daarnaast garanderen de talrijke recreatieve mogelijkheden dat u zich tijdens uw verblijf kunt vermaken in het hotel. Ontdek een boeiende mix van professionele dienstverlening en een breed scala aan faciliteiten in het D Mo Inn. Per ingang van 1 juni 2014, zal het stadsbestuur van Penang een lokale stadsbelasting van 3 MYR per kamer per nacht in rekening brengen voor 4 en 5 sterren hotels, en 2 MYR per kamer per nacht voor 0 tot 3 sterren hotels. Deze sterklassering zal conform de klassering van het lokale bestuur zijn en mocht de klassering op de website afwijken, dan zal de klassering van het lokale bestuur van toepassing zijn. Deze toeslag is betaalbaar aan het hotel bij het inchecken en in is niet inbegrepen in het kamertarief en de daarin vermelde belastingen. he location was great! right in the middle of George town so very accessible to many places of interest. Also the restaurant was very good with lots of great options. I was pleasantly surprised. The room we had was also quite spacious and very clean, we found it to be very comfortable as well. A/C was cold, staff was helpful, location was perfect for backpackers. Shared bathrooms could be cleaner but was not terrible by any means. Room was clean, towels, water, shampoo/conditioner/soap all provided. Would recommend for anyone looking for cheap accommodation! The room was clean.The hotel is also well located and can walk to many places in Georgetown! Good hostel with perfect location to discover the city. Room was small but clean. The location was great! right in the middle of George town so very accessible to many places of interest. Also the restaurant was very good with lots of great options. I was pleasantly surprised. The room we had was also quite spacious and very clean, we found it to be very comfortable as well. This entire experience was awful. Even from the start when I arrived to drop off my bags an hour before check in, I was barely acknowledged by the girl behind the counter. When I did get to my room, the sheets were wet and stained yellow. Even the fresh sheets were dirty, and ants were crawling on me when I tried to sleep. The shower/toilets are filthy with mold and no toilet paper is provided. I'm covered in mosquito bites after one night. The walls are so thin they shake from any movement in the hotel, and at 1am I tried to ask the desk for assistance to keep the party above me a little quieter, which they did not. My room smelled of urine and the bathrooms at night like old cigarette smoke. Instead of staying three nights I checked out first thing in the morning, and was met with laughter and rudeness by the front desk when I politely asked for some form of refund, anything. When I asked specifics to policy or why they wouldn't assist me, there only answer was "I don't know". As a woman travelling alone, someone asleep at the front desk with the hotel door wide open feels unacceptable as well. Nothing about this place has merit. The location was great and right in the hustle and bustle of the city, it was easy to locate and get to via Google maps. The check in was smooth and easy. Unfortunately, the room did not appear to have been cleaned from the previous guests. The bed had hair in it and several stains, luckily we had sleeping bags so just slept on top of the bed. There was lots of dirt on the TV stand, the TV did not work and the room was covered in mosquitos! Not sure of how they were entering, as there was no window in the room which made it quite gloomy. We stayed one night which we were glad at. The bed was comfy however and the staff were friendly enough. We would not stay here again solely because of the cleanliness of the room. Chulia Mansion is a great, stylish and modern hotel located in the middle of the historic part of Georgetown. The location could not be any better. The room itself was very good, also stylish, clean, with very good working A/C, good and comfy beds. The bathroom was also spacious, with separated shower, clean towels every day, with good smell after use which was not a standard in other good hotels we were staying during our trip. The staff was friendly and helpful. The breakfast was included and it was one of the best breakfast I have ever eaten travelling thru the world with my family. Generally a very good hotel. Location is great, easy access to China Town, Little India and more. Worth taking a Grab cab to further afield locations e.g. Gurney Plaza, Kek Lok Si temple, etc. . Varied each day slightly, local breakfast and western - the local foods are so much nicer, . Room was upgraded to Deluxe, which was nice. Some loose change did go missing after a clean though. Also, the toilet bidet should have a spray attachment, otherwise it's annoying to use. Courteous hotel staffs. Situated in the very neighbourhood of the heritage sites and plenty of food haunts to explore. Rooms are well kept and clean. The room we stayed in faces the main street but surprisingly it was not noisy. Walking distance from the ferry. Basic room, but nice staff. At night the street comes alive with every imaginable type of food vendor, all very affordable. Backs onto Little India. Bus stop right outside. Definitely worth staying here. The room was spacious and bathroom was clean. everything was worth it! great location right in the heart of georgetown. rooms were made speedily, and everything was quite clean.